This second edition of The Civil Code of the Netherlands will be an invaluable tool for lawyers, businessmen and students in their practice of, research or study into Dutch Law. 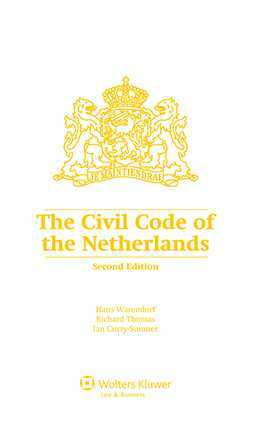 The first edition, published in 2009, reflected the Civil Code as in effect on 1 October 2008. Since then it has been supplemented by significant new statutory provisions, the most important of which is the addition of Book 10 (Private International Law), which entered into force on 1 January 2012. The translators, who continually strive to update, improve and modernise their translation, are Hans Warendorf, a Dutch advocaat and former senior partner of a leading Dutch law firm; Richard Thomas, a solicitor of the Supreme Court of England & Wales and London partner of the international law firm Vedder Price, both experienced cross-border legal practitioners who have worked together as a translation team for more than twenty years; and Dr. Ian Curry-Sumner, founder of the Dutch legal advice firm Voorts Legal Services in Utrecht, with more than 10 years' experience translating and lecturing Dutch family and inheritance law. Book 8: The Law of Carriage and Means of Transportation.